Faculty of Arts and Sciences (FAS) dean Michael D. Smith used his annual report to colleagues for the 2016-2017 academic year, being released today, to highlight an academic initiative focused on inequality in America; update data on the faculty’s makeup; and outline striking details about FAS’s capital spending on House renewal and other projects—and the resulting strain on its finances. science, technology, education, and health. “Inequality isn’t one problem,” Gay said in the annual report narrative. “It is a constellation of problems that are intricate and interconnected.” For instance, she noted, black children are three times as likely as white children to attend a school where than fewer than 60 percent of teachers meet certification requirements. The annual update on the composition of the faculty shows a fairly steady state (see the graph above). 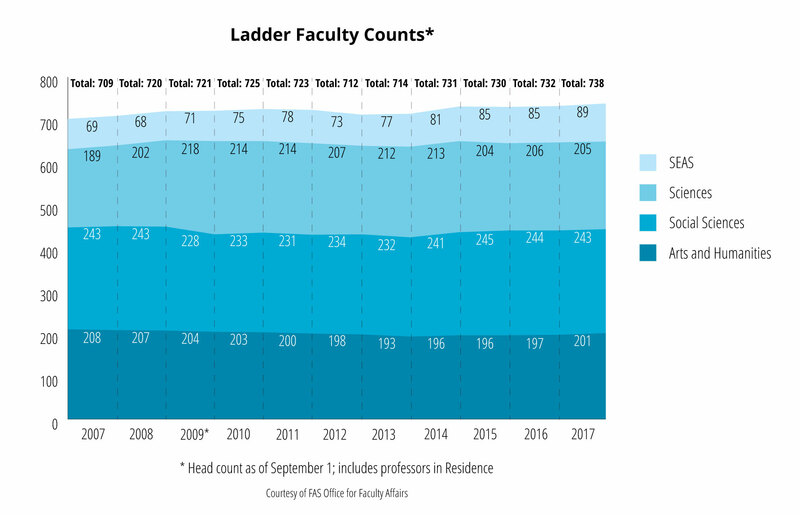 As of fall 2017, the ladder faculty numbered 738 members—up a total of six from the prior year, but within the bounds established immediately after the financial crisis and recession (between 720 and 725 ladder faculty members from 2008 to 2011; then a decline to 712 in 2012; and modest accretion since). The distribution of professors by academic division, provided separately by the office for faculty affairs, is consistent with figures reported last year (see “Here Come the Quants!”). The arts and humanities division had 201 ladder members this year, up from 197 (27 percent); social sciences, 243 members, down one position (33 percent); and sciences and engineering, 294 positions, up from 291 (40 percent), as the engineering and applied sciences cohort rose by four, to 89, and the life and physical sciences declined by one member, to 205. The major shift from the middle of the prior decade, before engineering and applied sciences was elevated from a division to a school within FAS (in the fall of 2007), is the relative growth in the new school’s ranks. FAS leadership signaled that it had exhausted its appetite for decapitalizing its endowment—taking extra distributions of principal—to fund House renewal. It had also more or less exhausted its unrestricted cash reserves, and so would resort to additional debt financing. No doubt, FAS would love to access current low market interest rates for that additional debt, but it doesn’t work that way: schools pay the blended Harvard borrowing rate, since the University issues debt on a consolidated basis, and its aggregate interest cost is about 4.6 percent. The debt restructuring, described in the financial narrative as emanating from a University proposal and agreed to in May 2017, looks like the outcome of a negotiation between FAS and the University: a way for the central administration and/or Corporation to signal support for pursuing House Renewal as a major priority, while recognizing that FAS cannot operate responsibly, nor invest in academic initiatives, without unrestricted cash reserves. The Corporation has authorized FAS to spend $873.9 million on the project, as of last June 3; the complicated Adams House project (with its many separate buildings) is yet to come, as are the large, expensive renewals of Eliot and Kirkland. FAS’s debt obligations rose to $1.03 billion at the end of fiscal 2017—up more than $151 million (17 percent) from the prior year, reflecting the shift to debt financing for House Renewal, and the accelerated pace of work as Winthrop House was completed for occupancy this past August, and Lowell House construction ramped up after Commencement. As previously reported, FAS had worked diligently to reduce long-term debt from $1.08 billion at the end of fiscal 2009—in part to create capacity to borrow anew for House Renewal, once it was clearer how capital-campaign fundraising for the project was going, and the actual costs of construction came in. The inflection point has not occurred, and FAS’s financial obligations to the future are increasing. Overall, FAS invested an extraordinary amount in capital projects, facilities, and equipment in fiscal 2017: more than $300 million. The FAS capital campaign had raised $2.84 billion in gifts and pledges as of June 30, exceeding its nominal $2.5-billion goal. But it is late in the campaign, and gifts for current use declined in fiscal 2017. FAS’s endowment is now $15.9 billion—still below the $16.7-billion peak value at the end of fiscal 2008. And those are nominal figures; FAS estimates that the endowment would have to be worth $19.7 billion, adjusted for inflation, to have purchasing power equivalent to the 2008 corpus. Financial-aid spending increased $12.3 million, or 5 percent, in fiscal 2017—but that was driven by growth in continuing education (up more than 10 percent) and graduate-student aid excluding fellowships (up more than 6 percent). The undergraduate aid budget rose slightly less than 4 percent, to $180 million. Salaries and wages increased 3.7 percent, driven by 3.0 percent annual merit increases and modest expansion in the number of FAS personnel (led by the sciences, where sponsored funding rose, and by continuing education). Costs for employee benefits increased just 1.6 percent. Looking ahead, FAS appears likely to exit the campaign with many of its facilities renovated; a faculty of roughly the same size, although not the same disciplinary distribution, it had a decade ago; substantially more endowment assets dedicated to funding financial aid; and, alas, continuing constraints relative to its ambitions, at least until it completes the largest building program in its history and defrays the associated costs of servicing its enlarged debt.